For centuries, Hopi men grew cotton and wove the fibers into blankets and clothing. In the 1880s, with the arrival of Anglo missionaries and government officials, quilting was introduced to the Hopi people and it quickly became integrated into Hopi culture and ceremony with quilts being used in every Hopi household. Hopis today are 4th and 5th generation quilt makers and as the artistic traditions of two cultures are blended, it is not uncommon to see a quilt with a traditional Anglo pattern and an ancient Hopi image, such as a kachina or a clan motif. This presentation includes a trunk show of Hopi quilts. 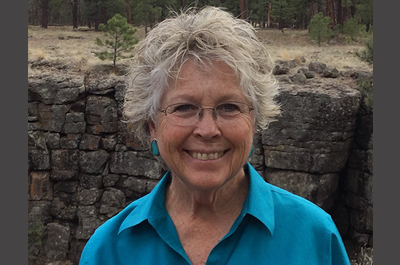 Carolyn O’Bagy Davis, a fourth-generation descendant of Utah pioneers, is the author of 14 books on archaeology, quilting and the history of the Southwest. Her book Hopi Summer was selected for OneBook Arizona for 2011 and Desert Trader was named one of the Best Books of the Southwest in 2012. 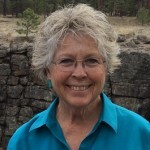 She was founding president of the Tucson Quilters Guild and Old Pueblo Archaeology Center and is an inducted member of the Society of Women Geographers and the Arizona Quilters Hall of Fame. Davis has appeared on HGTV, PBS, and Lifetime television programs and has curated many traveling museum exhibits.